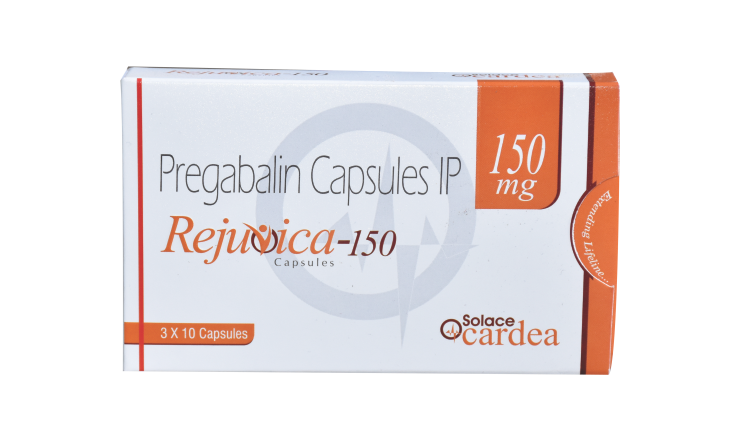 Rejuvica-150 capsules contains pregabalin. It is an anticonvulsant drug which is mainly used for neuropathic pain. It is adjuvant for partial seizure therapy. It also effective in chronic pain disorders such as spinal cord injury or fibromyalgia. Pregabalin produces its action by binding to the high affinity voltage gated calcium channel present in CNS tissues. It causes increase in the density of GABA transporter protein which increase its functional rate. After oral administration the drug achieves its peak plasma concentration in an hour. Presence of food effects the action of drug. The oral bioavailability of the drug is about 90%. The drug after oral administration does not bound to plasma protein. The approximate volume of distribution is 0.56L/kg. The drug can cross blood brain barrier and placenta. The drug follows renal excretion with renal clearance of 73ml/min.